September is a month of birthdays in my family. My granddaughters, my DMIL, two of my four sons and a DDIL all have their big day. When my granddaughters were here their dad decided to take a seat in my craft room and try making them each a card. They turned out really cute and I’m so bummed that I forgot to take pictures of them. 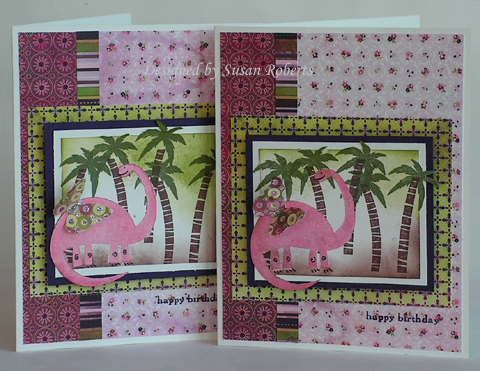 *hint hint, Gary* While the girls were browsing through my stamp collection they came across SU!’s Prehistoric Pals and wanted their dad to make them dinosaur cards! lol Well the weather turned around, the rain stopped and it was time to head back out to the lake. So those cards never materialized… until now. Their birthday was the perfect occasion for pink dinosaurs. And I absolutely LOVE Basic Grey’s new “Eva” designer paper. 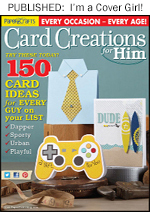 I’ve used five different designs from the collection on these cards. The butterfly is a Martha Stewart punch. I added a little Stickles to them for some sparkle. 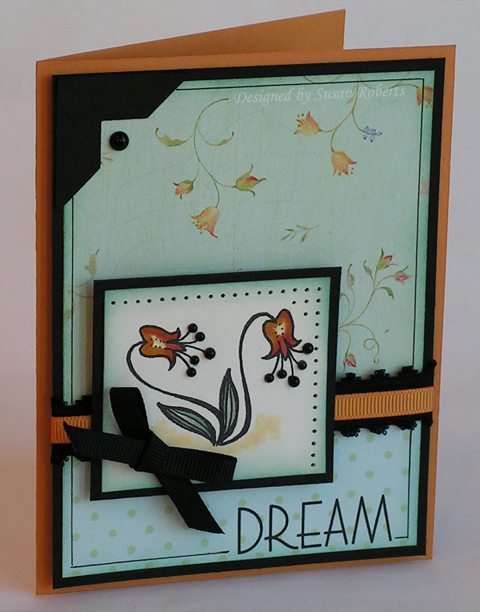 Beate is back and so are her weekly Inspiration Challenges! Here’s my card for this week’s challenge. Here is the inspiration piece. It is by Jo Moulton from Coldwater Creek. I used Flourishes “Poppy Patch” for the main image. I stamped the floral images on Basic Grey’s “Ambrosia” designer paper and then colored them in with LuminArte’s Pure Mica Powder in “Real Gold”. Nancy Kirk has made a wonderful tutorial for using these beautiful powders. 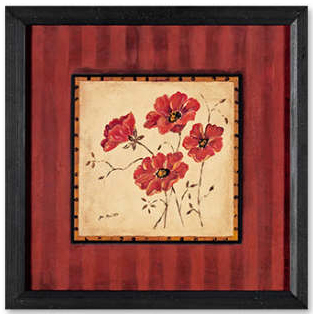 The background is brayered using SU!’s Rose Red, More Mustard, So Saffron, River Rock and Always Artichoke. I had such a wonderful time with my son and his family on their visit. But yesterday was very strange. All day I kept hearing the girls’ sweet little voices. And then I would remember that they had returned home. But I do have some pictures. 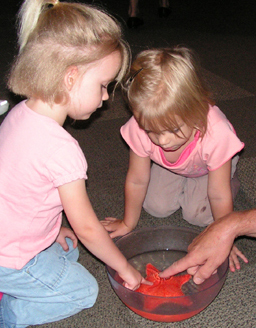 Here’s one of our visit to the Seattle Aquarium. I had no idea that starfish were so squishy! I have four sons and no daughters. Consequently my whole experience in buying clothes for my kids has always been all boy stuff… certainly no pink roses! 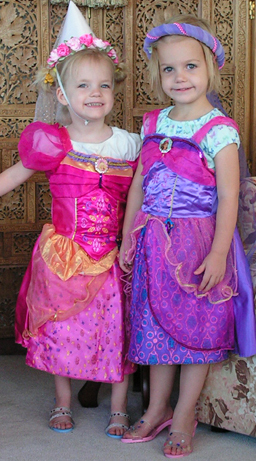 Well you can imagine my delight to have twin granddaughters (and another one on the way!)! I took the girls shopping, and we found these fun clothes. They humored grandma and dressed up for me. Hope everyone finds some time today to laugh and love and count your blessings. Happy Tuesday!! 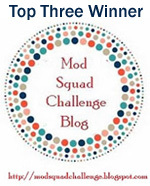 Each month just for fun on Splitcoaststampers the Dirty Dozen and Dirty Dozen Alumni have a challenge. The challenge this month was to make a birthday card without using the word “birthday” and to incorporate actual numbers into the design. I played along. Here is my card for it. 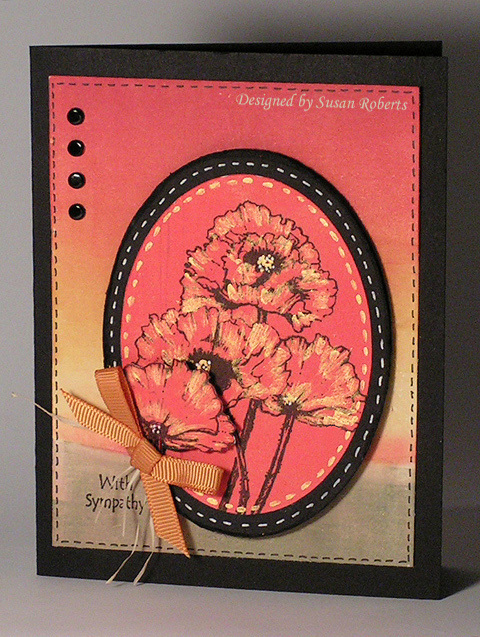 This card is made with one of Flourishes newly released sets called “Summer Blossoms”. I thought that some of the floral images in this set had a toile feel. 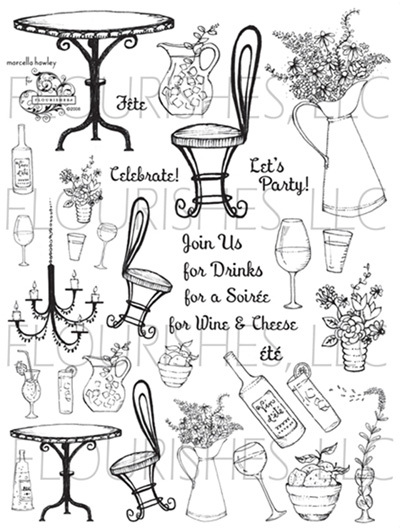 So using a couple of them I stamped a “toile-look” background. The three main image panels also use images from this set. 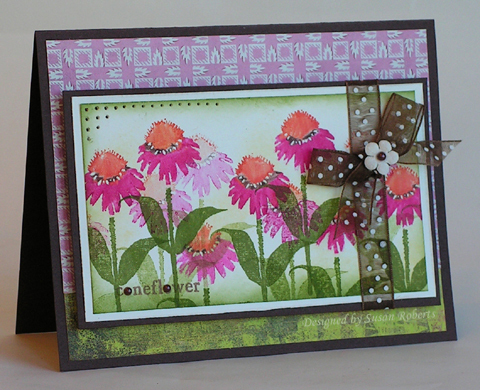 The sentiment is from “Summer on the Patio” which is another new set just released by Flourishes. I added Sakura’s “Stardust” to the buds for the sparkle and some Kaiser rhinestones for some bling. The scalloped edged ribbon is by May Arts. I haven’t been posting much lately, and this is why. 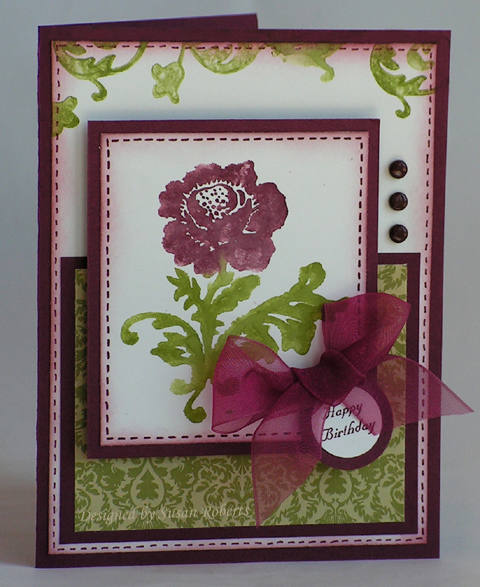 Here is a card using another one of the three sets released this week by Flourishes. It is called “Summer Blossoms”. I stamped the flowers with SU! Classic Rose Red Ink on Watercolor paper. Then, with my aqua painter, I used my Yoyo Yellow reinker and touched it down on the flower. The effect was a blend of colors that I thought was so pretty. 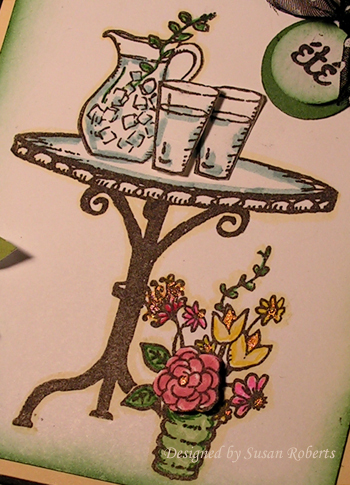 I cut out the flowers and adhered them to the card front. Here is the complete “Summer Blossoms” set. 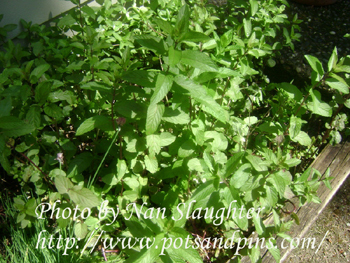 I love the graceful nature of the stems. 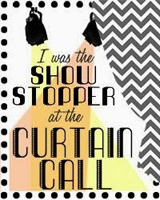 And yes… I stamped in the chandelier from “Summer on the Patio”. I just couldn’t help myself! 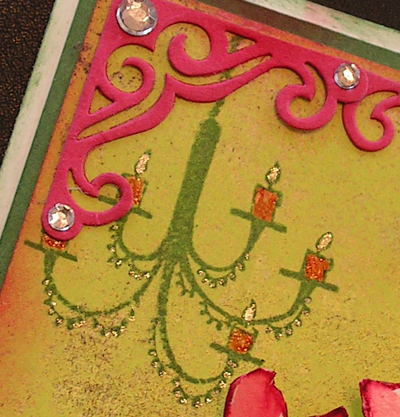 The candles are colored in with a red glaze pen. The bobbles and flames are glittered with a Sakura “Clear Star” pen. 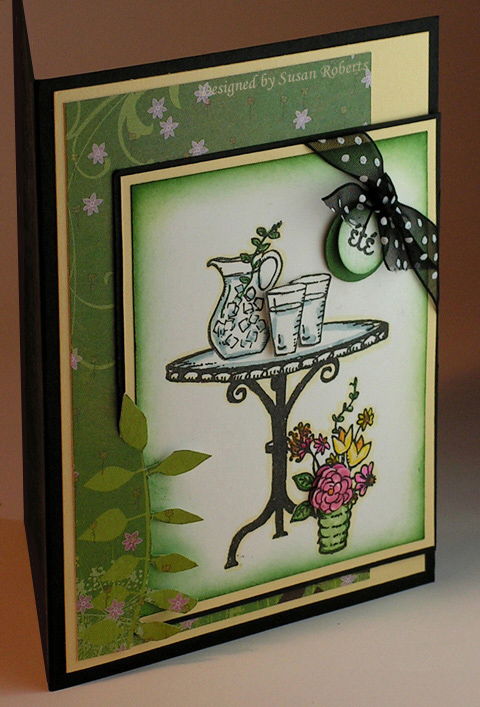 If you want to see some more cards made with this week’s releases from Flourishes, be sure to visit Barb, Faith, Julie, Leslie and Linda’s blogs. 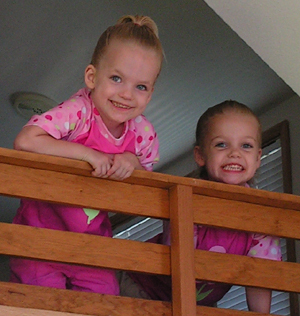 My son, daughter-in-law and (almost 4 year old) twin granddaughters are flying in tomorrow and staying for the week. I’m so excited to see them and have some grandma time. The girls have been taking swimming lessons and are all ready to play at our lakehouse, swim in the lake and go for some boat rides. 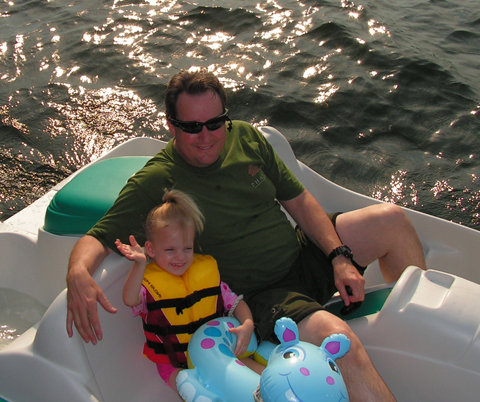 We may even get them to sit on the innertube with their dad and get pulled around! lol Have a wonderful weekend everyone! 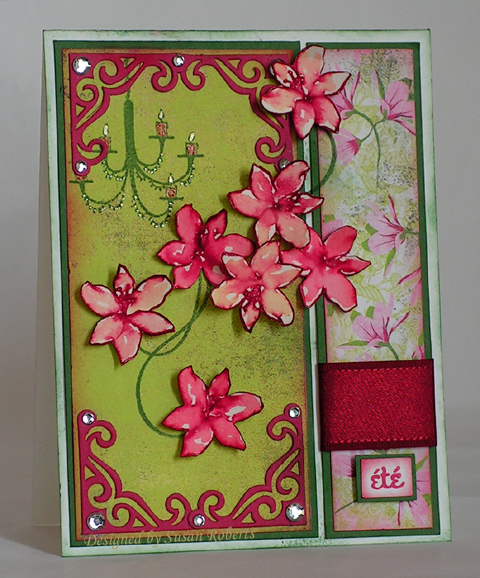 Today’s card is made using the “Summer Botanicals” set which is one of this week’s newly released sets by Flourishes. I colored directly onto the coneflower stamp using my SU! markers. I love this technique, and “Summer Botanicals” is a gorgeous solid image floral set that makes it so easy to do. Aren’t these fabulous!! 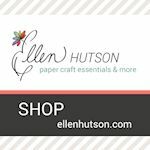 Check out Barb, Faith, Julie, Leslie and Linda’s blogs to see some more examples using this week’s new releases from Flourishes. 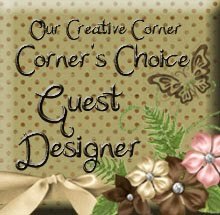 Welcome to Barb Schram who has joined Flourishes as a guest designer! Barb is so talented and it will be such fun having her on the team! You can read her bio on the Flourishes Newsletter. 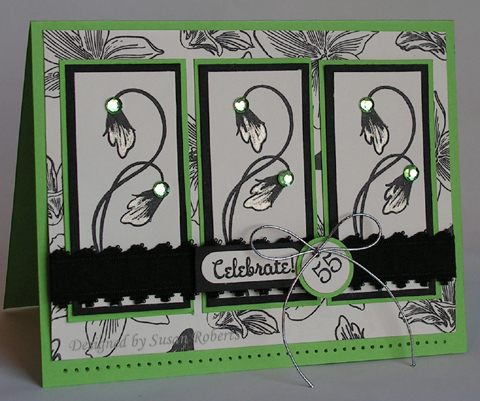 AND even more happening at Flourishes… Today is the release of 3 new stamp sets! On this card I’ve used one of them. 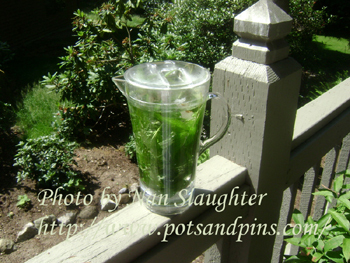 It is called “Summer on the Patio” . And it was SO MUCH FUN!!! I first stamped the pitcher and the floral bouquet. Masking these I then stamped the table. 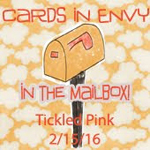 Both glasses and the large pink flower were stamped on a separate piece of card stock, cutout and popped up on dimensionals. The designer paper is Memory Box’s “Sprout”. I cut out around part of the leaf design on the paper and then tucked the main image panel behind it. These images are so fast and easy to color. I used SU! markers. 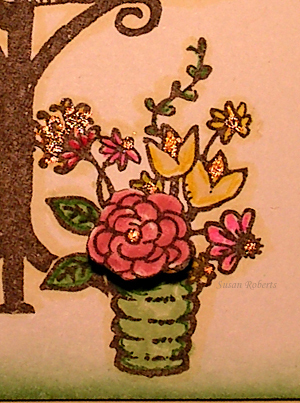 A touch of sparkle was added to the flowers with a Spica pen. It gives such a pretty shimmer with indirect lighting. The hardest part about this set was trying to decide which stamp to use first! Just look at all these wonderful images… 35 to be exact!!! 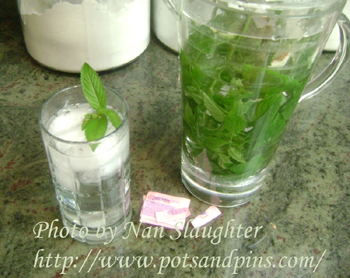 You can see Nan’s recipe for Velvet Mint Water on her blog Pots And Pins. Nan enjoys her summers on the patio! 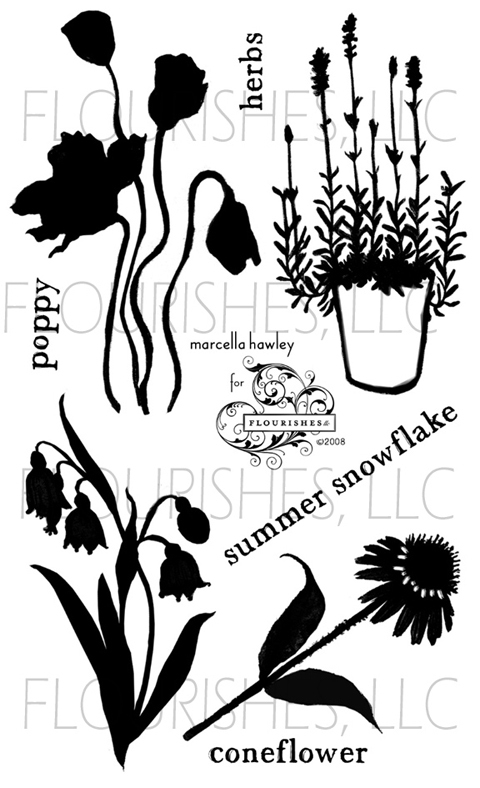 And now you can, too, with Flourishes fabulous new “Summer on the Patio” stamp set! 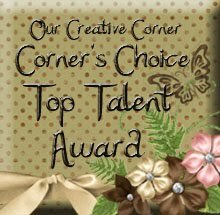 hehe Be sure to stop by the other Flourishes’ designers’ blogs Barb, Faith, Julie, Leslie and Linda and see what they have done with today’s new releases. 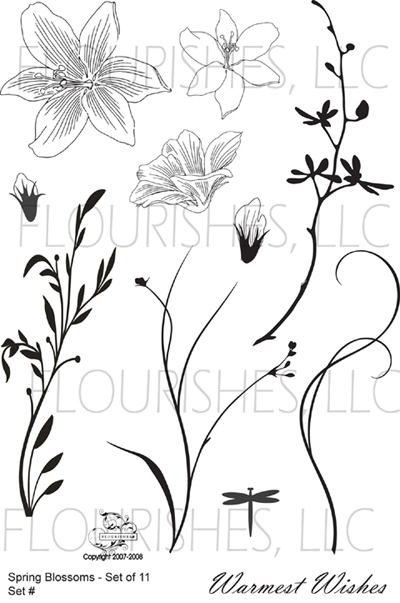 This graceful floral image is from Flourishes “Fantasy Floral Garden” set. 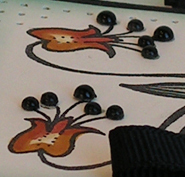 The flower has been stamped twice and then colored with markers. 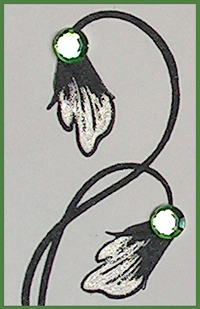 I added flat back pearls as a corner accent and to the ends of the flowers’ stamens. I’ve gotten really addicted to these pearls! They are so much easier to add than a brad or eyelet and can be quickly repositioned (not that I would ever change my mind about where I want to place an embellishment)! I drew a border around the card with a black gel pen. The scalloped ribbon is by May Arts. The sentiment is also from the “Fantasy Floral Garden” set. 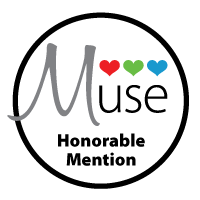 If you want to see some other cards made with this set then be sure to check out Julie Koerber , Faith Hofrichter, Leslie Miller and Jan Marie Caruso‘s blogs. Jeanne Streiff has released her own line of stamps over at Rubbernecker. I just had to place an order. They arrived a couple of days ago, and I couldn’t wait to play with them. 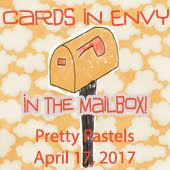 Today’s Limited Supply Challenge on Splitcoaststampers was the perfect opportunity to do just that! 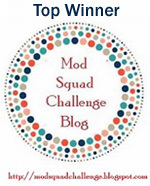 It is being hosted by Jeanne and the challenge is to make someone smile. 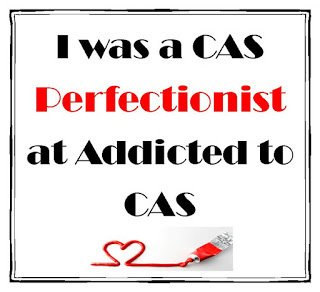 Well… this has got to bring a smile to Jeanne’s face, doesn’t it? Oh and my aunt, whose birthday is coming up, will hopefully smile, too, when she receives this in her mailbox soon. I colored the stamps with my markers and then misted them with a fine water spray. I love the effect of this technique. AND do you know what the best part of this day is? It’s FRIDAY!! Yay!! Happy Friday everyone!